I have been a teacher for fort years and am now semi-retired from classroom duties. I live in the city of Brisbane, which is in the far away land down under, called Oz, a long way from the ancient lands of Middle Earth across the Encircling Seas. I am a Hobbit in all but size and my Hobbit name is Fortinbras Proudfoot, most often called Mr. Proudfoot. My first contact with the Tolkien phenomenon was in Bundaberg in 1976 when a friend gave me a single volume paperback of "The Lord of the Rings". The story's opening chapters failed to capture my imagination and the book remained unfinished for a considerable time. It was 1978 when I met "The Hobbit". A teacher colleague was reading "The Hobbit" to our students and I soon bought a copy of this story and within a few weeks I had read "The Hobbit" and the unfinished "The Lord of the Rings". My passion for everything Tolkien was born. I now wanted to read more stories about Middle-earth. Each time I visited Brisbane I searched bookstores and soon purchased hardback copies of “The Hobbit” and “The Lord of the Rings”. Soon after I found the ‘Silmarillion” and “Unfinished Tales” and read them straight away. I still have these books and the original paperback I was given back in 1976. 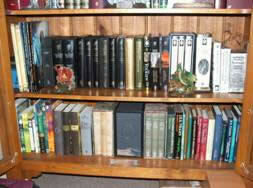 I remained in the Bundaberg district for several years and as a consequence my Tolkien collection grew very slowly and after ten years my collection included just eight hardbacks, a couple of paperbacks, three poster maps and a couple of calendars. In 1988 I transferred back to Brisbane and the collection began to slowly increase in size, but I was disappointed that I couldn't find more and living far removed from Europe and the US meant I had little knowledge of what could be collected. 1992 was the Centenary of Tolkien's birth and over the next few years many books of Tolkien titles and related subjects were published. 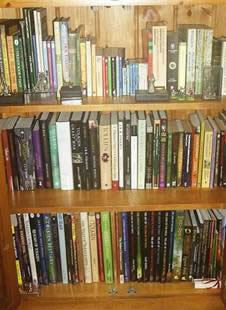 As well as local publications, I began acquiring books from overseas publishers. 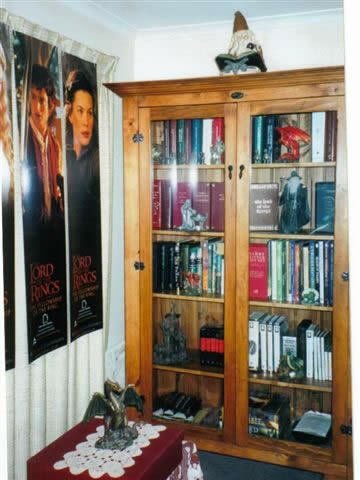 By the time the movie ("Fellowship of the Ring") was released at the end of 2001, I already had a sizeable collection mainly comprising books but I also had acquired pewter pieces, a chess set, audio books, calendars, cards, maps and posters. With the release of the movies I diversified the collection considerably and books for a time took a secondary role in my search for new acquisitions. I now have a large number of movie related items in my collection. During 2007 my interest in everything movie related waned and I’ve started once again concentrating on books. Currently there are over 800 items in my collection plus about 3500 TCG and Collector cards. 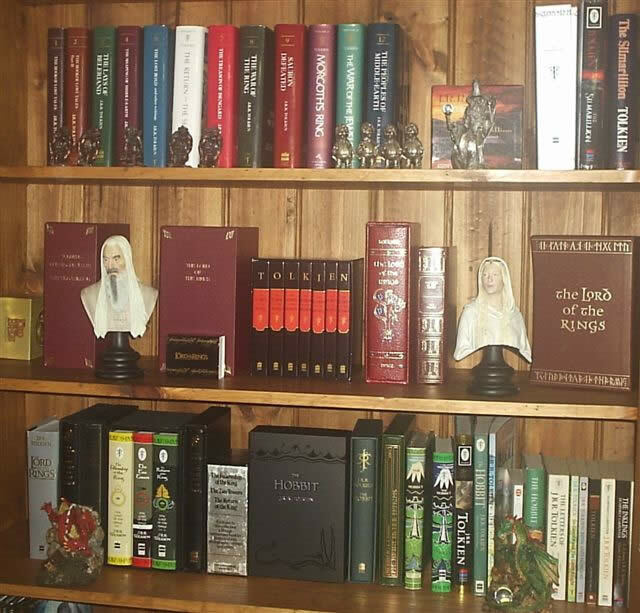 I now have over 350 books in my collection including various editions of “The Lord of the Rings”, “The Hobbit”, and editions of other major works. Also in the collection is the complete set of “The History of Middle Earth”, UK editions. Various editions of Tolkien’s other stories and works are included, as well as several books of academic works about Tolkien or his writings. 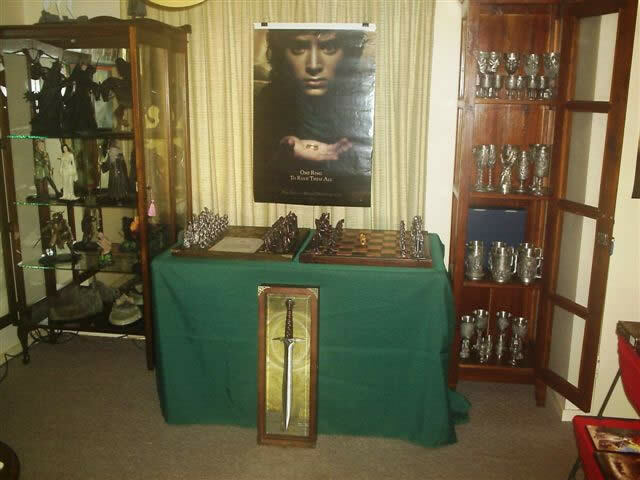 Other items include: 40 Calendars (1974-2010); 35 pewter items; about 100 movie statues and figurines; 26 ¼ scale helmets; over 100 maps and posters; 17 framed pictures and posters (7 autographed by movie actors); 30 DVD’s, CD’s and tapes; 9 large banners (flags); 7 Swords and Knives; 10 jewellery pieces (including the One Ring on chain); various games, bookmarks and other items; and two wonderful Chess Sets. Currently the collection has outgrown the space I have to display it in, but it continues to grow as new "must haves" are regularly found. 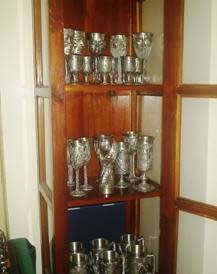 During more than thirty years of collecting there have been many great finds. In the late nineties I found a second impression set of “The Lord of the Rings” in a second hand bookstore here in Brisbane, a rare find in this part of the world. I have acquired a 1942 and a 1946 “The Hobbit”, which I’m quite pleased about. 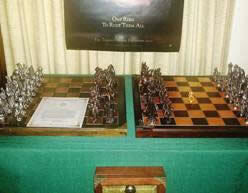 As already mentioned two beautiful Chess Sets are a pleasure to have as well. Each has a wooden game board with copper and wood squares. 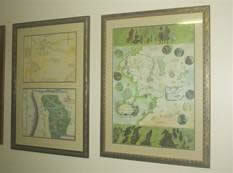 Pieces are nickel silver plated (white side) and Florentine bronze (dark side). With the use of the internet I see many treasures out there I’d like to own but monetary constraints hold me back from purchasing much more. Purchasing from overseas has its drawbacks, as shipping to Australia increases the price of each item and over time that amounts to a fair bit. I don’t have a web site at present but I would like to create one in the near future. In Brisbane we have formed a Tolkien Appreciation Association and one of my goals is to create one for the group. An outline has been decided on and work has begun in creating one. My interest in doing this was born a few years ago following my involvement with other collectors in a program which was sponsored by the Queensland State Library (Brisbane, Australia). The program was called “One of a Kind – Obsession and Collection”. 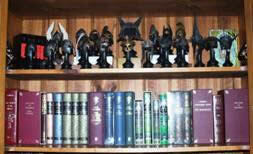 The Library was looking for people whose collections ranged from the bizarre to the simply huge. Nominees, including myself, were invited to participate in the project which resulted in a month long exhibition showcasing our treasures. Also, now that I’m all but retired I have started writing Tolkien related poems. I have made videos of some of my poems and have posted them on YouTube. 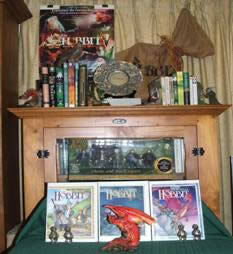 I’ve also posted videos of my collection and travels to the Movie Locations in New Zealand also. These videos can be viewed on my benalleyn channel. When the website is up, these and contributions of other members will be showcased. When I was young collections were about things like stamps or cards and later vinyl records or granny’s fine china collection but it seems now that for every conceivable object in this world there is someone who loves it…passionately. No matter how small or how big, nearly everyone has a collection of some things. Collections tell us something about people as well as stories about our present and our past. I have met people who collect mainstream things or unusual items. All these people are just as passionate as I am about what they collect. I cannot see myself losing the passion of continuing to collect “Treasures from Middle Earth” in the foreseeable future. When you're passionate is there ever enough?